I recently posted the recipe for my Matcha Donuts with a Cacao-Pistachio Glaze (the recipe can be found here) which was featured at my June Breakfast Club. Those donuts were just one of the many delicious plant-based recipes enjoyed at the event, and I have been desperately wanting to share with you another favorite of mine from the day. These Vegan Frittatas have become a staple in our household and are one of the tastiest non-egg (but kind of resembles an egg) recipes I have ever made when it comes to breakfast. Before I went plant-based, I loathed eggs. Very rarely would I ever enjoy them unless we were out to eat or if it was the only option type of thing. Cereal or toast with peanut butter and banana were pretty much all that I could handle first thing in the morning. Being that I have always been more of a sweet than savory kind of gal, it has truly surprised me how much more savory I have become ever since going plant-based. 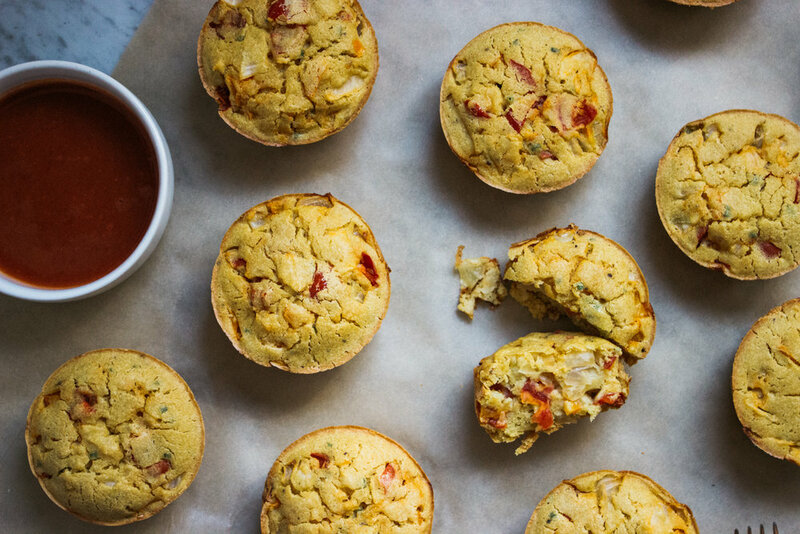 Of course a green smoothie or bowl of oats is my go-to breakfast, but more and more often I crave something super warm and savory, i.e., avocado toast, and these Vegan Frittatas!!! These frittatas taste amazing all by themselves, but if you want to get creative, try dipping them in some hot sauce or refined sugar-free ketchup, enjoy them on a plate with breakfast potatoes, veggies and avocado, or even on top of a salad! The possibilities are endless for these little bites of plant-based gold. And they are of course dairy, egg, gluten, grain, and refined sugar-free, and are packed with protein, fiber, and B vitamins from all that fortified nutritional yeast. Which also gives them their deliciously cheesy taste! 2. Combine chickpea flour, nutritional yeast, baking powder, chives, onion + garlic powder, salt, and pepper in a bowl with 2 + 1/2 cups water. Whisk to combine and set aside while preparing the veggies. 3. Spray a standard-sized muffin tins with olive or coconut oil. Divide veggie mixture between muffin cups by the heaping tablespoon. Using a 1/4 cup measure, fill cups with chickpea batter. Use a spoon to gently stir each cup to ensure the batter gets under the veggies, and divide any remaining veggies between cups. 4. Bake for 25-30 minutes, until a toothpick inserted in center comes out clean and frittatas are beginning to brown on top. Remove from oven and allow to cool for 10 minutes (this allows the batter to set) before removing from tin and placing on cooling rack. Depending on your muffin tin, you may have to use a knife or offset spatula to gently loosen sides of frittatas before removing from tin. 5. Serve warm or allow to cool completely before storing in an airtight container in the fridge for up to 5 days. Frittatas can be reheated in the microwave but are best when warmed in the oven or toaster oven at 400 degrees F for 10 minutes. *This recipe is considered neutropenic, however, I would recommend sautéing your vegetables before placing them in the muffin tins to cook with the remaining ingredients.